A work injury in Iowa could lead to complex regional pain syndrome (CRPS), which is characterized by severe pain and swelling as well as sensitivity to touch. It is usually associated with arm or leg injuries, specifically ones that include nerve damage. If you have been diagnosed with complex regional pain syndrome after a work injury in Iowa, you should speak with a Des Moines Worker's Compensation lawyer. Your lawyer can work with you in your efforts to maximize your Iowa Workers' Compensation claim. Complex regional pain syndrome is a chronic condition that rarely originates in any other body parts besides your arms and legs. decreased ability to move the arms, legs or affected body part. Your CRPS symptoms will vary, depending on the severity of your condition. The initial symptoms you may experience include redness, swelling, hypersensitivity and temperature changes. As CRPS progresses, your affected limb might become pale and cold as your nails and skin undergo changes. At this stage, complex regional pain syndrome is usually irreversible. Type 1 - this type, which is the most prevalent form of CRPS, has also been called reflex sympathetic dystrophy syndrome. It occurs after an injury in which the nerves in your affected arm or leg were not directly damaged. Type 2 - known in the past as causalgia, Type 2 CRPS involves a distinct nerve injury. Complex regional pain syndrome usually occurs after forceful trauma such as that of a shrapnel blast. Other trauma such as a sprained ankle or a broken bone can also lead to complex regional pain syndrome. Since CRPS is often associated with previous injuries, you'll want to discuss the circumstances surrounding your initial work injury with a Des Moines Workers' Compensation lawyer. What is the Treatment for Complex Regional Pain Syndrome? Spinal cord stimulation - electrical currents sent to your spinal cord may alleviate pain. When CRPS is not treated, complications that could arise include muscle loss and contractures in which your hand or foot will contract into a fixed position. What Should I Do if I Have CRPS After a Work Injury? Sometimes it is necessary to have a workmans' compensation attorney to assist you after you have been hurt at work. 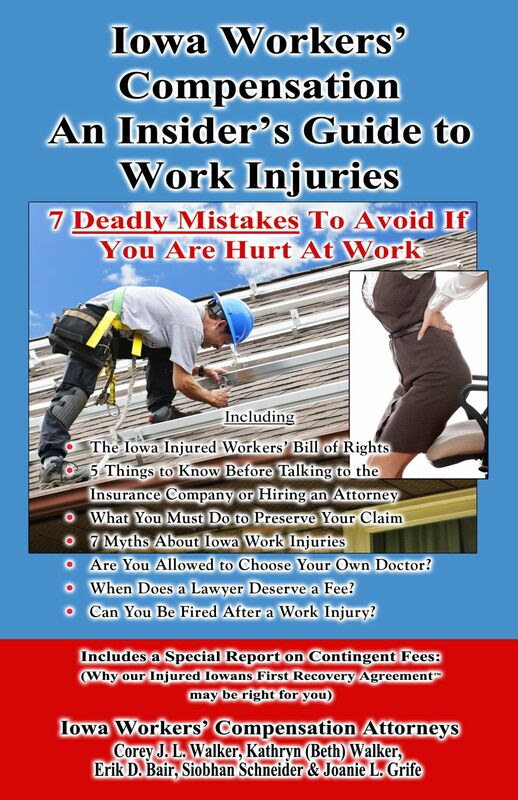 To learn more about Iowa's workers' compensation system including the 7 Deadly Mistakes to Avoid if You are Hurt at Work order a copy of our book “Iowa Workers’ Compensation- An Insider’s Guide to Work Injuries” by going clicking on the book or by calling 1-800-707-2552 (ext. 811) (24 Hour Recorded Message). Why offer a Book at No Cost? Iowa Workers' Compensation Attorney Corey J. L. Walker offers his book at no cost because he has represented hundreds of Iowans hurt at work and seen too many clients make mistakes before they knew about their rights and responsibilities costing them thousands of dollars. Iowans injured on the job are beginning to realize that the work comp. insurance company is not there to help them and they should at least consider having someone on their side to help them. Finally, you can learn about Iowa work injuries in the comfort of your own home with no cost, risk or obligation. For immediate assistance or to schedule your FREE workers' compensation case evaluation, call 515-440-2852 and ask for Corey or Erik.